In May 2008, the Fund established a Task Force on world food security. This was at a time when high world food prices had attracted policy and media interest. The Task Force was led by Mr James Ingram AO; a former Chief Executive of the World Food Program and former head of what is now AusAID. Other members of the Task Force were the Hon. John Anderson, Professor Kym Anderson, Dr Terry Enright, Dr Tony Fischer, Dr Tony Gregson, Dr Gabrielle Persley, Dr Bruce Standen, and Professor Beth Woods. Dr Denis Blight served as the secretary for the Task Force and with Dr Persley and Mr Ingram substantially wrote the report under the oversight of the Task Force. The report was published in October 2008. 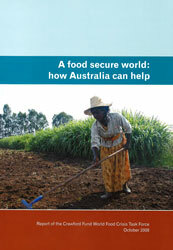 The report was a significant contribution to thinking about Australia’ role in creating a food secure world. The Fund’s recommendations went well beyond international agricultural research and covered public policy, rural development, emergency aid, post-emergency processes, Australian exports of food and knowledge about food production, the geographic distribution of the Australian aid program, and the scope for greater engagement of the not-for-profit sector. However, its core recommendation was that the formulation of the Australian Government’s response to the world food security crisis should be predicated on a substantial increase in the proportion of Australian aid allocated to agriculture and rural development. 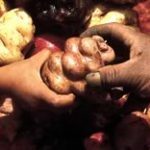 The Australian Government welcomed the report as ‘a timely synthesis of the causes and impacts of the recent world food crisis, with clear policy options identified for the Australian development assistance program’. The Minister for Foreign Affairs also said that he ‘would warmly welcome continued engagement of the Crawford Fund on issues relating to food insecurity’. The Government accepted the core recommendation of the Task Force report and supported in full or in part 27 of its 31 recommendations.